The lessons learned in the design of the R-1 and Be-10 were incorporated in the design of a much improved flying-boat based loosely on the Be-6 and identified originally by NATO as a re-engined version of the older type. 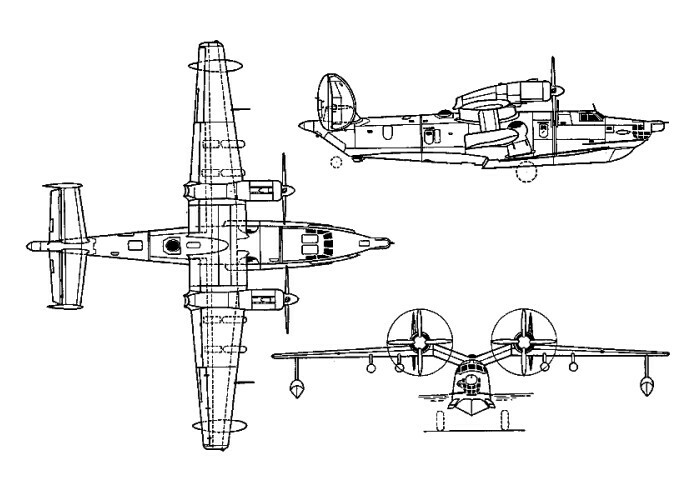 The Be-12 Tchaika (Seagull), designated M-12 in AV-MF service, has the gull-wing layout and twin tail of its predecessor. The greater power and lighter weight of the turboprop engines have permitted a forward extension of the hull, with a new planing bottom. The prominent spray suppressor around the bows of the Be-10 is also a feature of the turboprop aircraft. The addition of a rectractable landing gear makes the Be-12 amphibious. MAD (magnetic anomaly detection) gear extends 15 ft behind the tail. The search and mapping radar projects far ahead of the glazed nose, and much of the hull is filled with equipment and there is a weapon and sonobuoy bay aft of the wing with watertight doors in the bottom aft of the step. The Be-12 turboprop aircraft, first seen at the 1961 Moscow Aviation Day at the same time as the swept-wing Be-10, has fast become the Soviet Union’s standard large marine aircraft. The weight-lifting capability of the Be-12 was demonstrated in a series of class records for amphibians set up in 1964, 1968 and 1970, suggesting a normal weapons load as high as 5000kg. The Be-12 can load on the water through large side hatches in the rear fuselage, and stores can be dropped through a watertight hatch in the hull aft of the step. Be-12s have set many class records for speed, height and load-carrying. They were based all around the Soviet shores and in Egypt and, possibly, other countries. It is also believed to have been used for mapping, geophysical survey and utility transport. By Soviet standards the type was not built in large numbers, only 95 being reported in service in the late 1980s. Armament: at least 6600 lb (3000 kg) sonobuoys and AS bombs in internal weapon bay; one to three external hard points for stores under each outer wing.